Not looking quite so fresh in third at 4km into the run is O'Grady who now trails Brown by 2:44. Just to confirm the top ten in the elite men's race coming into T2. In eighth Simon Cochrane (14:12), Carl Read ninth (14:16) and Nick Baldwin (14:49) in tenth. Looking a little sluggish in fourth is Aussie Reithmeier who passes the 4km point of the run 6:00 down on Brown. Cameron Brown has just gone through 7.4km on the run. His lead from Bozzone is now 48 seconds. O'Grady passes 7.4km on the run 3:40 down on Brown in third. 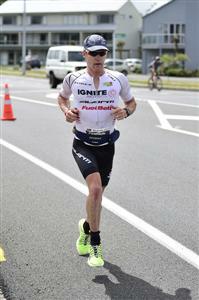 So as we approach a quarter distance on the run, Brown is looking very good for what would be his 11th IRONMAN NZ. Reithemeier 6:13 back at 7.4km. Approaching 10km into the run and Brown's advantage now 1:15 over Bozzone. Dylan McNeice sits fifth (12:55) down at 7.4km with Schifferle a further 31 seconds back in sixth. Melanie Burke enters T2 in third some 21:33 down on Kessler but a little over six-a-half minutes adrift of second placed Crawford. Stephanie Jones of the USA is the fourth athlete in the elite women's race to reach second transition. She trails Kessler by a massive 25:55. Cameron Brown has reached the 14.2km mark in 6:26:19. Cameron Brown's grip on the race is strengthened. He is 2:05 clear of Bozzone at 14.2km. The battle for third is rising in tension. 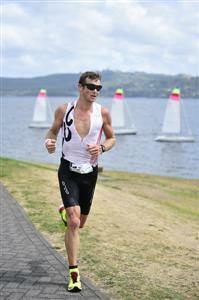 O'Grady is now 5:58 behind Brown at 14.2km, but significantly his advantage over Reithmeier is now only 43 seconds. At 3.8km of the run, Crawford, the 2009 champion, trails Kessler by 16:49. Masterful Brown has opened up the gap to Bozzone to 2:20 at 16km. Kessler has turned at 7.4km in the women's race and should she run around 3:06 she can threaten her own course record time of 9:08:06. A switch around in the battle for the final podium spot. Alex Reithmeier, who is looking in great shape, has moved into third, relegating a struggling O'Grady to fourth. Relentless Brown strides past 17.6km in an overall time of 6:39:48. Can anything or anyone now deny him victory number 11. The gap back to Bozzone at 17.6km now 2:36. Terenzo is now consistently shedding time to the ten-times champion. Meredith Kessler continues to push clear of the race -0 now 17 mins ahead of Gina Crawford after the first 7.4kms of the run at the turn. Just beyond the halfway mark, Brown's continues to push relentlessly on. At 21.3km the gap is 3:13 on Bozzone. Reithmeier is 6:31 back in third behind the champion elect. O'Grady is losing time hand over first on his rivals and he is now 10:43 in arrears..
A quick update from the elite women's race. Kessler chasing her own course record is 17:33 clear of Gina Crawford in second at 10.9km. The 24.7km split confirms that Brown now holds a 3:37 lead on the chasing Bozzone.